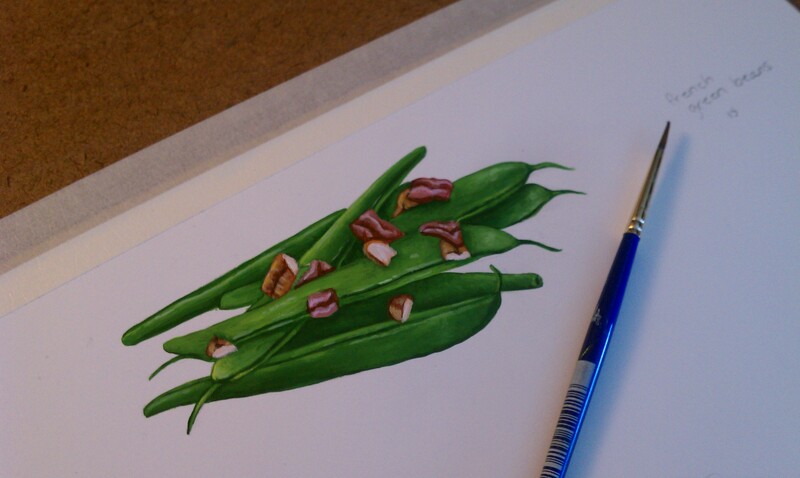 This is the first concept piece I did for the Foodie Club by Dani Shear. This piece is what ultimately won me the project. 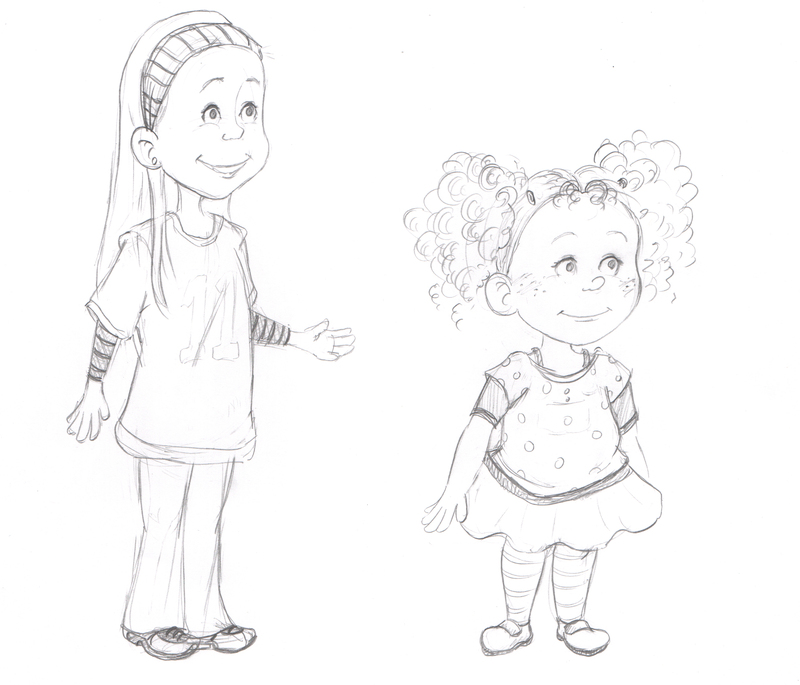 After I was chosen, I began sketching the main character, trying to find the right look and personality for the main character. I experimented with different media and style. finally I created the Syd and Sunny right for the Foodie Club. Happy New Year! Before I start blogging about 2013, let’s start with finishing up 2012. 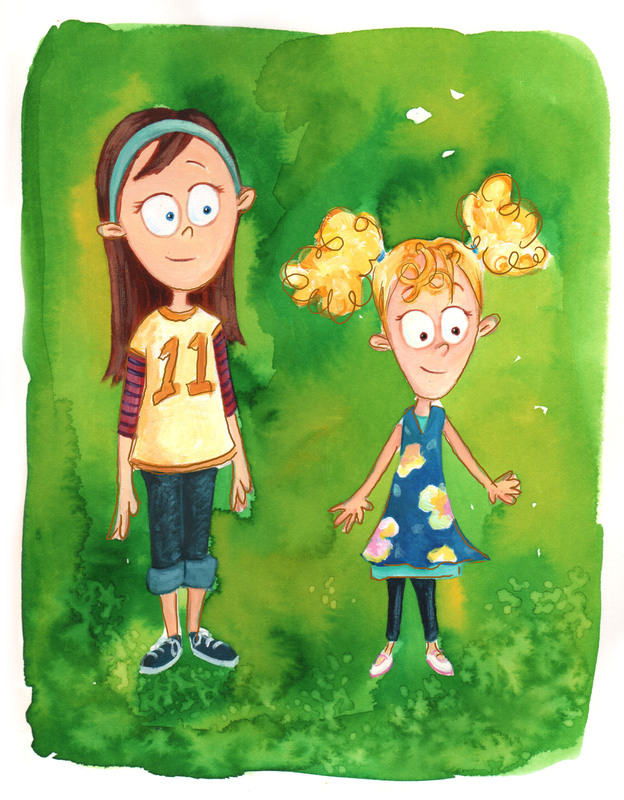 2012 was a banner year filled with a new book to illustrate, a new baby girl, and a new studio! 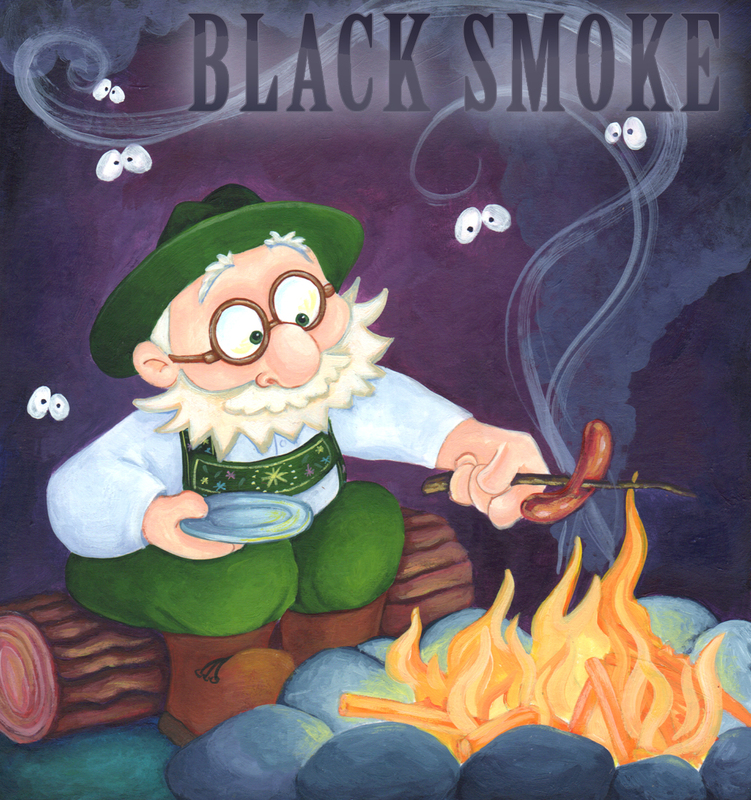 To start 2012 off, I was contacted by an author through Cedar Hill Publishing to illustrate a new book early last year. I can proudly say that the book is finished and soon it will be on its way to the printers. This was my first book that I chose to use acrylics as the primary medium. I love painting with acrylics. I am very happy with the way this book turned out. Soon after I got the Snuggle Moose contract, I got pregnant with our second child. Of course we were thrilled, but being pregnant certainly made it a challenge to get things done quickly. 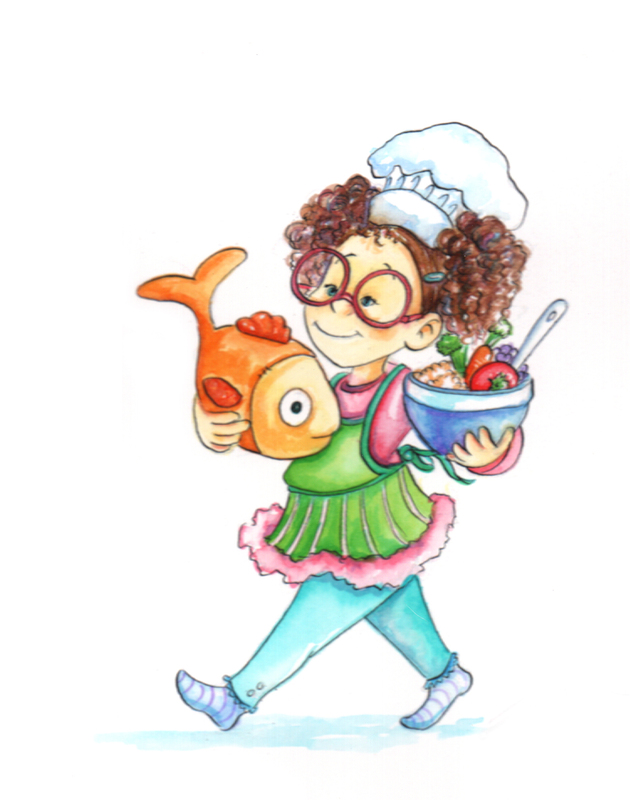 Because I am a stay at home mom and a freelance illustrator, I have to find creative ways to get my artwork done. So usually I paint during the hours that my son was asleep. Well, while pregnant my energy was pretty low and chasing around a two year old all day really wore me out. So I split my time that I normally would be painting with some much needed naps myself. Another new thing that we did this past year was add on to our house to make room for our new little one. 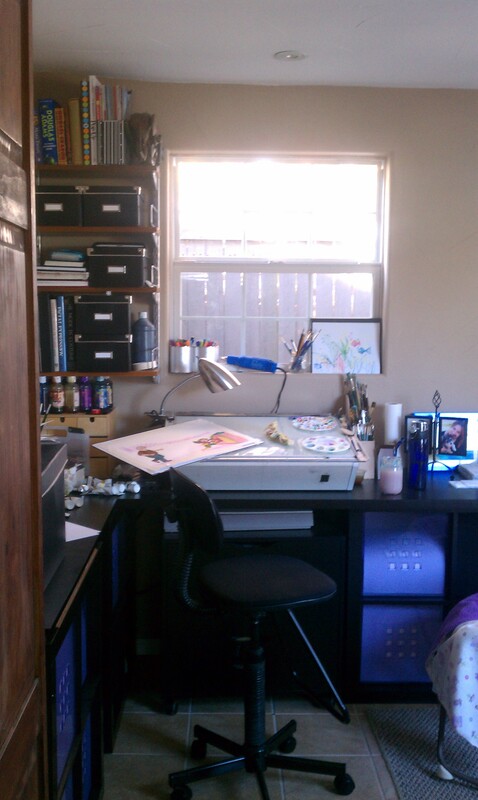 So this meant that I finally got my studio space that I so desperately wanted! We were able to add it on to the master bedroom, so that when I paint late into the wee hours of the morning, I can quietly slip into bed and not disturb anyone. 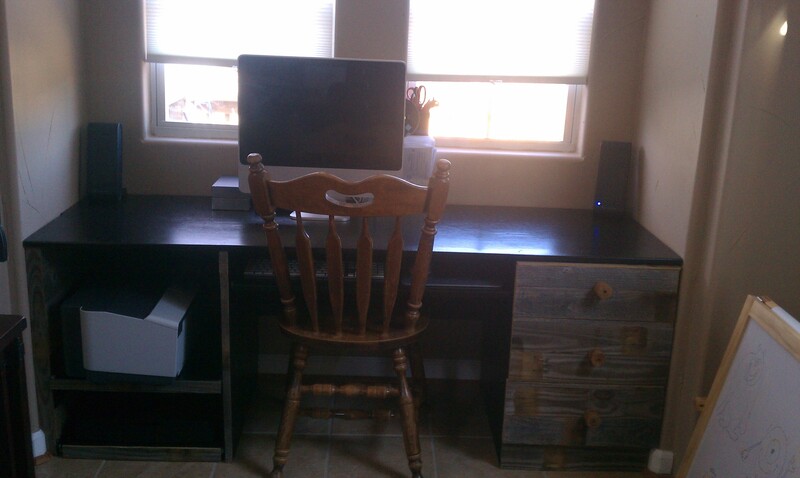 Here is our custom built desk that fits into a little nook that out looks our back yard. Love it! This is my main working desk with loads of storage and flat table space! I love to spread out when working on a project. 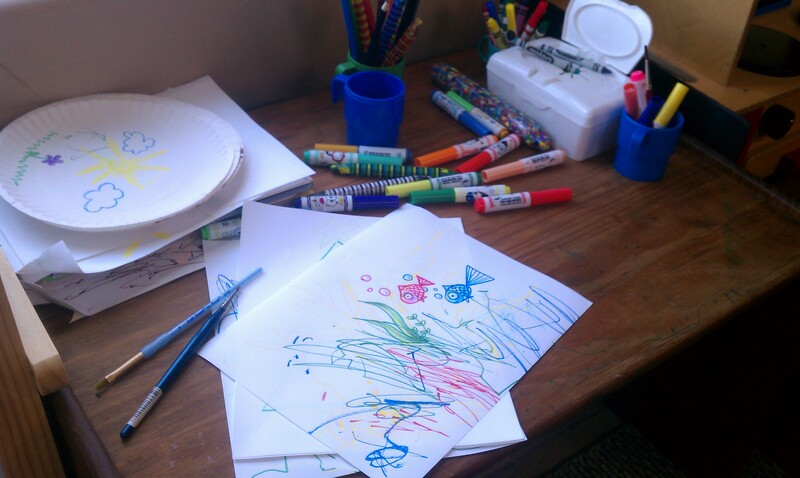 We also included an art studio space in the office for our kids. Tons of markers, crayons and watercolors to use whenever. I have to admit that I love using the old school supplies as well! On the desk you will notice a drawing that Aidan and I did together. It’s one of my faves. When Julia was born, I gave myself a few weeks to adjust and then it was back to painting. I was determined to get Snuggle Moose finished now that I had my energy back. Thankfully Julia is a great sleeper and loves to be wrapped up on me while I paint. It took a little getting used to with her in front of me, but I got it. 2012 was a great year and I look forward to making 2013 even better! My son LOVES Toy Story. He would watch it all day everyday if he could. I was going through some of my old artwork and found this piece that I did my senior year of college, for my Game Illustrations class. 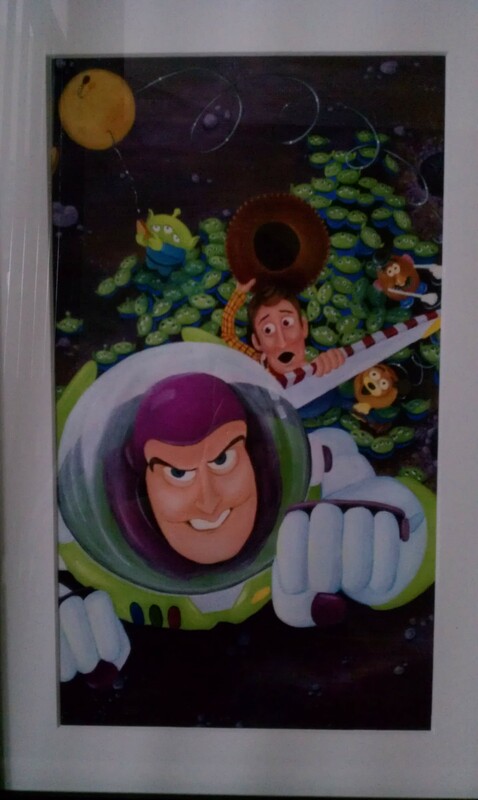 I had forgotten how much I LOVE Toy story! So I dusted it off, and went and had it framed and matted. 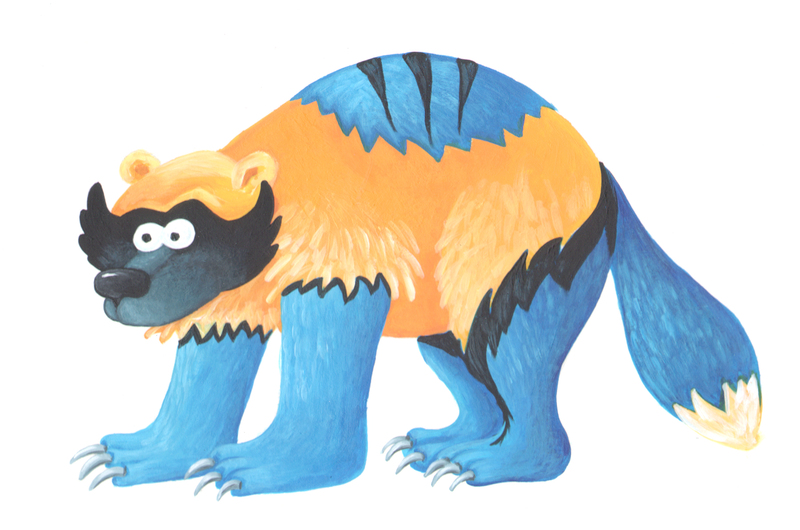 When I showed my son the illustration, he gave a huge smile, but he started to get upset that it was trapped in a frame and that he couldn’t play with it. We found a nice place to hang it in his playroom. 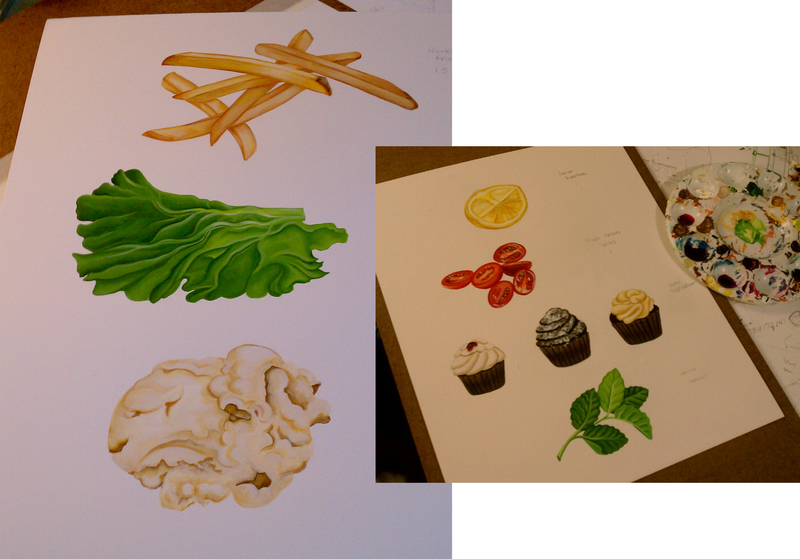 These past few weeks, I have been busy painting food items for a national steakhouse chain. I have really enjoyed creating these little images. Although I have to be careful not to paint on an empty stomach! Mmmm….those mini cupcakes look really tasty, I think it’s time for lunch! For years, my husband has been asking me to draw him Wolverine, his all-time favorite superhero. 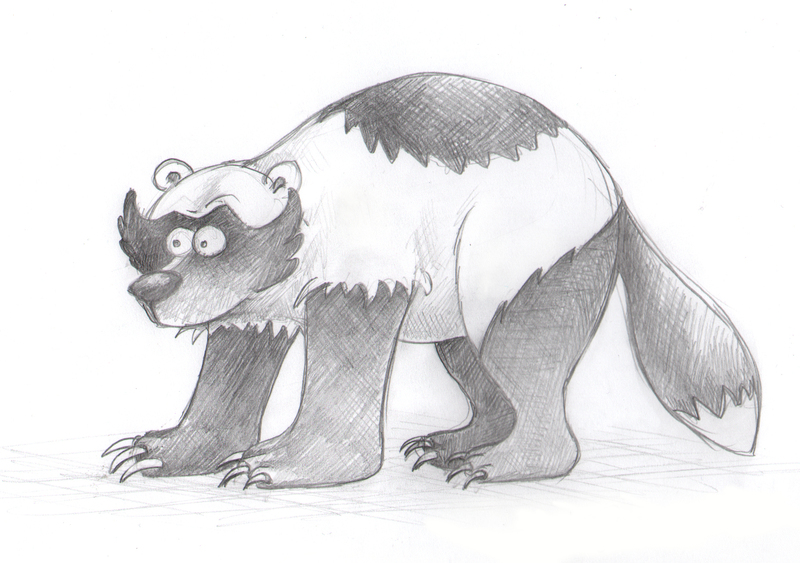 So, for the holidays, I decided to draw him a wolverine….adding my little twist. He of course loved it, but then requested that it get painted. So for his birthday, I painted the wolverine. I came up with this illustration idea this summer during one of the hottest and longest drought in Texas history. I remembered from my childhood when my sister and I would go outside and perform ‘rain dances’ and beg for it to rain. Somehow it always seemed to work. (probably because we would start the dance when it was cloudy). Remarkably, while I was painting this little girl, we had our first thunderstorm in months. #hollyillustrator Follow me on Instagram to see all the art I create while my children are asleep. 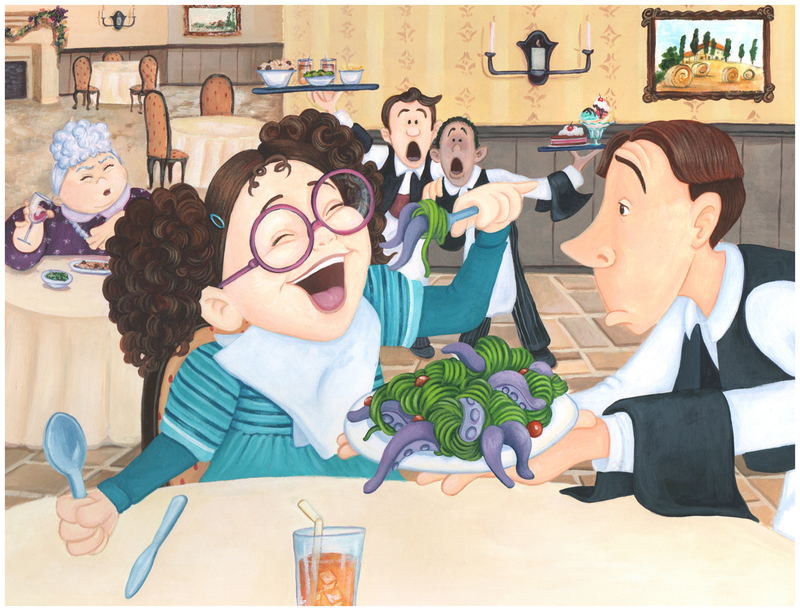 Another spread finished for Potato Land!